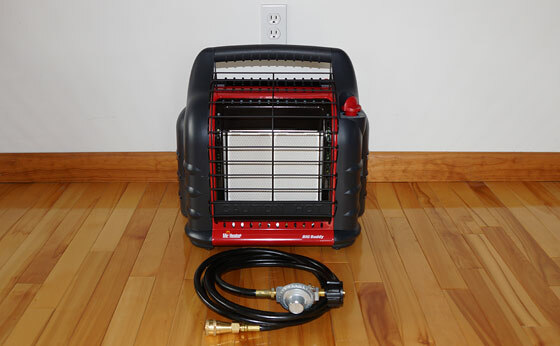 I believe that this is perhaps the best indoor portable propane heater for emergency preparedness heating. During the winter, I always reevaluate my emergency backup heat sources for my home. I run through the scenario of a power outage, especially one that might last longer than just a few hours. Why? To be sure that I have adequate sources of backup heat for keeping warm – other than my main source of home heating. One product that I discovered (and purchased) is the ‘Mr. Heater Buddy’ (pictured above). Although having several of these is not my only source of backup heat, I have found them to be quite effective (and portable) for winter preparedness emergencies and peace of mind! It’s a portable propane heater – indoor safe for home, cabin, garage, workshop, tent, trailer, rv, greenhouse, porches, patios, hunting blinds, etc.. Regardless of whether you heat with oil, natural gas, LP, or electric, chances are that somewhere in the heating system is a device that requires 120-volt electrical power to operate. This might include components such as a blower fan, pumps (oil pump, water circulation pumps), electronic igniter, thermostats, etc..
Having said that, a common severe winter storm scenario involves electrical power outages caused by storm damage. A power outage during a winter storm (especially an ice storm) will often last longer than you might expect due to the poor weather conditions and getting crews out there to begin repairs (getting through the snow and ice, cutting trees, limbs, repairing lines, etc.). Most every home heating system today requires electricity, regardless of it’s fuel source (except a wood stove…). The ‘Mr. Heater Buddy’ portable heater will function without electricity and will operate during a power outage. The Mr. Heater Buddy really cranks out the heat! Two models – one up to 9,000 BTU, the other up to 18,000 BTU. In addition to 1 lb propane bottles, the heater can optionally connect to a barbecue grill style ’20 pound’ propane tank for a long lasting fuel source (or any propane source provided that you have the adapter hose). I do recommend using this adapter hose with a larger tank because the 1-lb propane bottles are much more expensive (although convenient for quick portability). If you do use a 20 pound (BBQ) tank, it is recommended to keep that tank outdoors. You might snake the hose through a window. Stuff a towel in the crack (to keep cold air from getting in) as you close the window on the hose. The 9,000 BTU model has a standard design to accept a 1-lb disposable propane bottle. The 18,000 BTU model will accept two 1-lb propane bottles. Typically, you will not leave this heater on all the time. So the propane fuel consumption numbers listed here may actually last longer. The use-case scenario may be to heat up the room (area) and then shut off the heater until needed again. Saves lots of fuel this way. The better insulation you have in your home, the longer it will take to cool down again. Note: This article has been updated and re-posted for your information and further comment. Spent a week in a tent at 8,000ft hunting turkey last November & the Mr. Heater was our best friend. We lived in our motorhome last May, when the nighttime temps were high 30s low 40s. The buddy heater was our only source of heat, as our furnace was not hooked up. On high, we would be nice and toasty, but on low you would get a bit chilly. A 1 lb. tank would last about 6 hours on low…and 3 hours on high. We also wore extra layers and had sleeping bags. Oh yeah…we also warmed up food with the buddy heater. According to the product documentation, the heater can only be used indoors with the 1-lb bottles. Not that I haven’t used it with the 20#/30# cylinders, but as a disclaimer, it is not rated for use indoors with the larger bottles. A quick search on Amazon also turns up adapters to let you refill the small 1-lb cylinders. I use a kerosene heater. Kerosene is nice. But it smells when used in a heater. I use this heater in a small hunting shack, used with a BBQ tank ( 20 pounder) it takes the chill off the night and early morning. Worked all week on half tank, it really made our hunt more pleasent. The 18k BTU/hr Tough Buddy I have works very well. The blower operates on 4x D-cell batteries or an optional 6V/800mA adapter. I also purchased the 12′ hose assembly for connecting to a larger tank, a fuel filter, and a 1# bottle refill adapter. The Mr Heater supplements a Toyo kerosene heater. The Toyo may put out more heat, but I must say the Mr Heater is my favorite for portability and ease of use. I found one at my local Bass Pro shop, check Lowes, Home Depot, Cabelas or other out door stores. Got my first one from Wally World. Got the next from Tractor Supply. The reason why I got the second from Tractor Supply was because I had a gift card for there. Love the Mr Buddy heaters. The one from Wally has two connectors for the bottles. The Tractor one has a single. Doesn’t matter since I only need one for using the big tank. Yep, your link looks to be the same one I got from Northern Tool years ago. Paid for itself in just a few refills. You tube has videos on how to use it. While your on Amazon pick up a hose to allow appliances designed for the 1 lb. bottles to use the 20 lb. tanks. For those of you that live or camp at higher elevations be aware that the automatic low oxygen shutoff will cause you some problems. I was in my truck camper at 10,000 plus feet and after a few minutes the Mr. Buddy Heater would shut off. Tried the heater again when I got home 4,700 feet and the heater worked great. Took it with me next time I went xc skiing at 10,000 plus feet, and had the same problem. Unfortunately I never took the time to figure out at what altitude the automatic low oxygen shutoff will start causing problems. I just bought a different type of heater with out a low oxygen shutoff as my camper has both a CO2 detector and smoke detector. When I was in college in Montana, I was living at about 6,000 ft elevation and never had a problem with the Buddy heater. Worked perfectly fine for a few winters there. Used the smaller one all winter long in my trailer at 5300 ft. On low it kept my TT at 67 deg. Even when the outside temps were in the high teens and low 20s which is average where I live. I had NO problems whatsoever. I am hoping it will continue to work this winter. Its going to be in the teens this weekend already. Worked in our hunting cabin on our recent elk hunting trip. Worked like charm. I have a 400 sq ft all glass sunroom with a high ceiling and hot water baseboard heat that can’t adequately keep up when the outside temps drop to the mid-twenties. Mr. Heater Big Buddy solved that problem. I refill the one pound bottles from a 20# tank using the adapter. Easy to do. Screw on the bottle, turn the tank upside down, open the valve, wait for the hissing to stop, close the valve, turn the tank upright, and unscrew the bottle. Takes five minutes to fill both bottles. I do have a CO detector, but the ceramic heating elements pretty much ensure complete combustion. I turn it off when I leave the house. Yes, I never use the Buddy heater when no one is around. I have both the large and small Mr. Heater Buddy models and have used them both to heat tents, campers and hunting blinds…and they’ve worked flawlessly. The time listings for the LP usage are pretty accurate from my experience. I would recommend these heaters to anyone looking for an alternate or backup way of heating a space. We’ve been using a Big Buddy to suppliment our heat in our 40′ 5th wheel which we live in the North Georgia Mountains. Since it is a catalytic type heater there is very little carbon mox generated. We’ve used it for 2 years now and it does a great job. The RV furnace is only about 40% effective and most of the heat goes our the exhaust. This heater is great to augment the heating system saving us a great amount of propane and money in the RV during the day. These heaters are almost 100% effective. We do not leave on unattended…..
Several years ago had 1 week power outage in NC from ice storm. Temperature below freezing every night. Used Little Buddy with 20lb tank to heat three rooms-bathroom and two bedrooms. On high for 2-1/2 days on 20lb tank. No CO problems. Put heater in bathroom. Rooms about 65F. A daughter and 80year old grandmother slept in bedrooms with only extra blankets. Have CO detectors now but don’t think it was problem. Real efficient and easy to use. I live in an RV and the built in heater went out in early January of this year. Two electric heaters kept the place warm when it was nice, but in sub freezing temps I used a Portable Buddy heater to warm the place up when it was too cold inside. It took 20-30 minutes to raise the temp from the low 50s to the upper 60s. That’s pretty good considering the built in heater can run all night in that cold of temps. The CO detector never went off. I spent one hard cold winter in an apartment with only a portable propane heater. One word of caution with propane indoors, MOLD. Burning propane gives off water. We stayed warm but everything was damp. Going outside in the cold was made worse from the dampness. Great for short term, but the longer you use it, the more moisture you put in the air. Idaho, yes moisture. We have a propane wall unit in our building and I it is weird how it is warm but damp. When the unit goes off it gets cool quick. I am not fond of propane. I used the Buddy most when living in Montana. It was very dry there and never had problems with moisture. Then again, the apartment was poorly insulated if at all and poorly sealed windows. Similar, have a Big Buddy, 20 lb. tank hose, fuel filter for back up to the generator and woodstove. Many extra 20 lb. tanks and 1 lb. bottles, need the refill adapter now. In the duck blind I use the Buddy heater that is a small portable that screws onto the 1 lb. BOTTLE, can’t recall the formal name, unfreezes the hands. Have a small canvas tarp over the lap to capture the heat while sitting most of the day in the woods deer hunting, no more shivering and have dropped a couple deer while toasty warm, a little extra weight to hike in but worth it. It’s a Mr. Heater Portable Buddy, works nice, even better for the camp unheated glassed porch late October cigar time. Our home furnace is propane (we live out in the country). We have two semi-permanently mounted emergency/supplemental propane heaters that hang on the wall. They are connected to the main propane tank just like our furnace. The connections are not meant to be fussed with as they are set like one for a furnace or kitchen stove. There is a little petcock valve to shut off the propane supply to the heater when not in use. The problem is one of them is broken and they are both very old – need replacing. New versions of the same heaters run about $300 each. I”m wondering if two of these buddy heaters would be a better option, but not sure how we could accomplish connecting and disconnecting them to the main supply. May be a regional thing, but in the small town closest to my place, the hardware store, and even one auto parts store, stock propane wall heaters every fall, and inevitably, sell those that haven’t sold by spring for half price. Sometimes they even have free standing heaters for even less. Have seen them for less than $100. I have a couple of old style open flame propane heaters, one that I bought at an auction when I was 12 years old. I use them as portables, running them off 20# bottles using the hose and regulator scavenged off of propane grills. On connecting the Buddy Heaters to your household propane system, the answer is no. The regulator on your current propane source is set for appliances w/o their own regulators. Buddy heaters have the regulator built in, and require full pressure coming in from the tank to work properly. I’m guessing you could cut the built in regulator off and attach fittings to connect to the house source, but a lot of work and may be opening a can of worms. Would definitely void any warranty. I have used Mr Heater Buddy for years with 1 lb bottles but if the temp gets down in the 30’s I have always had problems with the water in the propane freezing and shutting it down. I saved my lunch money for a year and, buying a piece at a time, set up solar with a 200 watt panel, charge controller, big honkin’ battery, inverter, and a 1500 watt electric heater, all for under 1000USD. Now I use heater buddy for backup, plus have fans and LED lighting in my little 10 foot popup and a comforting little power source for troubled times at home. You can also connect to many other things with one, like a Coleman two burner stove. Do the heaters have a thermostat? Will they go on and off to hold a temp? Or sorta hold it, just curious, that would work in my greenhouse for raising temps for starts. The Buddy heaters do not have a thermostat. Just adjust the dial for the desired heat output level. I think for us a buddy would be perfect for keeping the greenhouse warm for faster seed starting, hook it to a big tank and turn it on every night, combined with a couple big grow lights and i can quickly propagate year round, during the winter months the greenhouse is a bit sketchy, overnight lows in the high 40s low 50s is just too cold, the stuff sprouts and grows but not with the usual vigor that i get during warmer months. I also have both the single and double Mr. heaters, and the hose for 20 pound bottles. Looks like those are going to be my backup heat for now, as I don’t have a wood stove right now. I buy a few 1 pound bottles whenever they’re on sale. Have got quite a few now, and have 4 of the 20 pound. I figure I could go about 3 months before I run out, then freeze to death. Guess I’d better get more. Good idea. I bought one of those stove boards that you put under a wood stove to set mine on. Not to big, about 28 in. x 32 in., and 1/2 in. thick. Same principle as sheet pan. This sort of straddles the topic. Am thinking about using propane patio heaters in outdoor covered spaces – back patio, carport, outdoor kitchen. Anyone with experience with them please comment on effectiveness and efficiency. Thanks. GF bought a single one pounder Buddy, long before we got together. She told me supposably there is a built in CO2 detector?? ?, that shuts the unit down if CO2 is detected. In any case we still crack a window open on the horse trailer when using it and I installed a CO2 and smoke alarm JIC. Usually just the pilot light takes the chill off and then crank it up to low/high when changing clothes. We are fair weather campers not too often we camp when the night time temps are below freezing….. except last October when I went. I think she purposely sent me out that weekend…..lol. I would like to know also about those patio heaters. Seems like being out in the open they wouldn’t do much?¿? There’s not a built-in detector. There IS a built-in auto shutoff if it tips over or kicked. There is a built in low oxygen sensor, right? At least that’s what I understand. I think it would have to be a pretty small space to produce low oxygen, and I think the instructions recommend cracking a window or something just a tiny bit to ensure a little fresh air. A while back someone here helped me with this question. I believe that the heater has a built in low oxygen sensor but it isn’t the same thing as a carbon monoxide detector. Not sure how far I would trust a sensor in something that is bound to get knocked around. I got a carbon monoxide detector for less than $20. Sleeping in space heated by any type of fuel combustion is ALWAYS risky. Especially ones that do not use a vent to get rid of exhaust fumes. These heaters likely depend on catalytic converters to ensure complete combustion of carbon to CO2, rather than emitting in-complete combustion of CO. I wouldn’t trust these things for sleeping unless you had at least 3 or 4 carbon monoxide detectors next to the beds. I kid you not. When toying with a chance breathing of carbon MONoxide, you best have back up detectors and a back up for the back up. The consequence of one little malfunction is DEATH. No wonder they’re “guaranteed”. They won’t be sued by dead people. I appreciate your comment and concern. Given their market claim, (indoor use), they would be out of business if they were not safe to the extent that’s claimed. Very important for EVERY house, regardless. Your article above is excellent Ken – kudos to you! I recall when small propane catalytic heaters first came out, the round affairs with a screen in front of them. They were meant for temporary use in well ventilated places and… claimed to be safe. However, people with campers or small travel trailers used them overnight, and sadly these heaters started killing people – in spite of claimed to be “safe”. At times, whole families died together; so sad, and so easily avoidable. I don’t recommend anyone to simply buy off on a manufacturers market claims. The stakes are far too high to blindly put all your trust in their claims. Ken adds: Regardless of the product, the manufacturer, the type of heater, it is unwise not to add simple insurance –> A CO detector. I don’t care if it’s the emergency heater that I wrote about above (which has a good reputation and no incidents that I am aware of), OR your in-house heating system (whatever type it is). It’s common sense. The trouble with todays product testing is that products don’t receive sufficient beta testing (third party testing). As a result, WE the users or customers, become the beta test. I for one refuse myself or family/friends to be a beta testing lab rat. For this reason, if folks want to use such devices indoors and while sleeping, I highly recommend numerous CO detectors near the beds, and to run all back up detectors simultaneously. The stakes are simply too high NOT to do this. Is your life worth $100 in a couple extra detectors? This is first-hand life insurance. Don’t become a statistic! Just FYI: as CO2 in breathing air gets higher, the result on us is to breathe faster; we gasp for breath. The same holds for lower O2 in the air. NASA found this out early on when astronauts were tested in a pure O2 environment. Their breathing became “lazy” because lack of CO2 tells our body we don’t need to breathe! Tho too much CO2 or too little O2 is obviously dangerous, its not even close to the risk that breathing CO presents. I have two of the big ones, long hose, splitter and two short hoses. Big Buddy heaters are the bomb! I was on vacation a couple years ago and the furnace went kaput. The house sitter called, it was 10F outside and the furnace guys could not get there for 2-3 days to fix it. The house sitter called around and managed to get 3-4 electric heaters. They kept the house warm enough to keep the from pipes from freezing. The furnace guys showed up and fixed the problem, nothing was damaged. After-Action-Report findings- Bought 4 Big Buddy heaters, the hoses, adapters, AC adapters to run the fans, the bags to store them, a pallet of 1 pound Coleman propane cylinders. 10ea 20LB cylinders and 5ea 40LB cylinders in reserve. All of this is stored in the shed and ready to use.